In Germany every parent is entitled to a parental leave of up to three years for each child and this right applies to both parents equally. 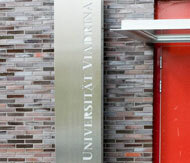 If you are employee of Viadrina, you may take time off work for up to three years to care for your child. While on leave, the parent may work a maximum of 30 hours a week and s/he benefits from protection against job termination. For the first year of the parental leave and after having met certain requirements, parents may apply for Parental Benefit. Should you plan to take a parental leave, we advise to consult Family Representative.